Stainless steel 12mm fore- and backstays and 10mm diamondstays. Selden aluminum mast 17.80m off deck. A fully battened mainsail and a roller-furling genoa (2010). Profurl genoa roller-furler. Asymmetric spinaker 105m2. 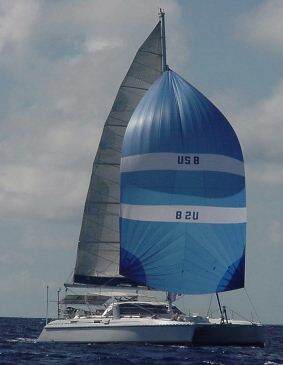 Symmetric spinaker 75m2. 4 Andersen winches, 2 electric. 1 Electric Harken winch. Hulls are built with Twaron reinforced fiberglass foam sandwich, decks and cabin with thick solid fiberglass. Lock Crowther designed asymmetric hulls with daggerboards creating better upwind performance and shallow draft. The relatively high bridgedeck clearance above the water reduces wave bumps. Plenty of storage for lines, jerrycans, fenders and anchor winch with 75m galvanized steel anchor chain. 4 Lockers before the mast, 2 under the cockpit floor and 1 under the cockpit seat against the bulkhead. 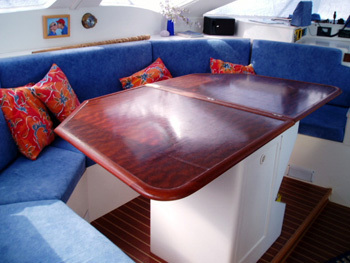 At port-side of the cockpit (3.75m x 2.80m) a teak table with seats around for many. A canvas bimini covering the cockpit protects against UV and bad weather. 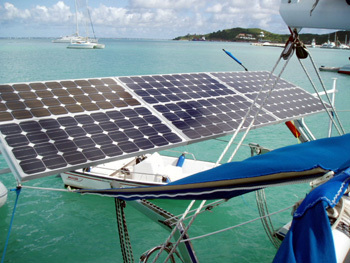 A windgenerator and a angle adjustable rack with 6 x 85-Watt solar panels are part of the bimini construction. 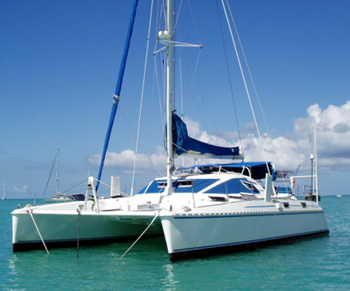 The hypalon Caribe dinghy is hooked on stainless steel davits. Twin steering columns with ample view around under sail as well as in harbor maneuvering. Engine controls at the port-side steering stand. Transoms with steps. A swing ladder and fresh water shower at port-side. From the transom steps an easy access to the dinghy. 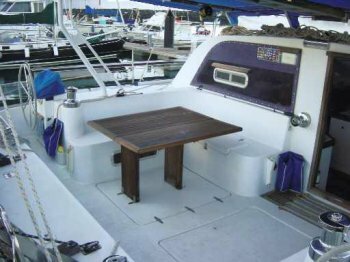 Madeleine has a roomy bridgedeck saloon (3.10m x 4.70m) with a big folding table and a U-format comfortable bench seating 8. At starboard the navigation station with chart table, control panels, instruments, SSB radio and radar. The galley is located against the bulkhead facing abaft enabling communication with the cockpit through a hatch in the window. Curved windows around with 4 opening hatches for ventilation. From the cabin while seated there is a 360 degrees panoramic view. Forward a shed with a work bench and storage for tools and spare parts. 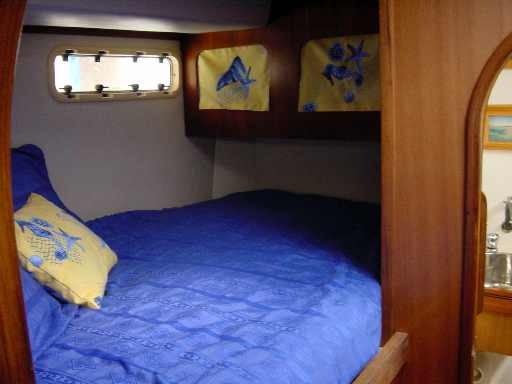 Amidships a double bed cabin with closets and a separate sanitary room with toilet and shower. Aft of this, midship access steps to the bridgedeck saloon with storage space abreast. Next comes a second double bed cabin with closets and its own separate sanitary room with head and shower. Astern ample access to the engine room. All spaces mentioned have solid access doors. 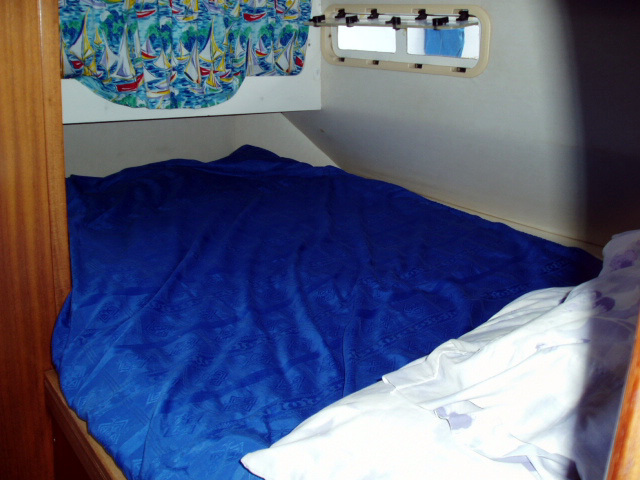 All rooms are well ventilated by deck and side hatches. 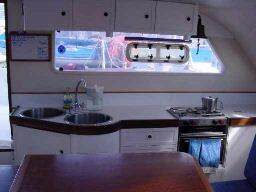 Located astern in both hulls the engine rooms are accessed bij solid sound proofed doors. At sea this inside through hull access is much safer than outside access solutions. 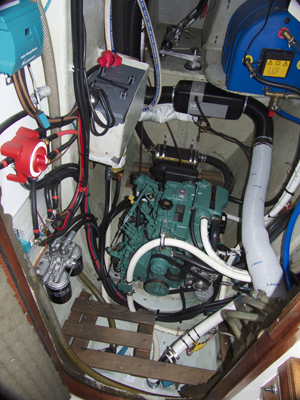 Both engine rooms contain (apart from the engines) the diesel powered Webasto air heater and the hydraulic steering system connected to the rudder heads. Port engine room: autopilot connection to the rudder head. Starboard engine room: 30L hot water boiler, antenna tuner for the SSB radio, regulators for solar pannel and wind generator. Two 30Hp fresh water cooled Volvo Penta D1-30B diesels with 130S-B sail drives and folding 3-blade bronze propellers, installed 02-10-2007. Mastervolt starting batteries with regulators installed June 2011. Forward a big storage room for sails and cordage. Follows a shower room with a sanitary sink, closet and mirrors. No head here. Amidships a cabin with one bed accessibel by ladder. With extra playing ground and storage for toys this cabin is designed for children. Abreast the access steps to the bridgedeck saloon a library with book shelves. Between these steps and the engine room a state room with a double bed, more book shelves, closets, separate sanitary room with sink, mirrors, closet, head and shower. Access to the engine room mirrors the port-side. As in the port-side hull all rooms enclosed with solid doors and ventilated with deck and side hatches. The galley-up configuration (in the bridgedeck saloon) with the galley facing the bulkhead window offers many benefits: lots of daylight, communication with anyone in the saloon and cockpit, a service hatch to pass items to and from the cockpit. Separate LED lights above a counter with double sinks with fresh hot and cold water and a separate foot pump for pumping up salt water. A propane gas marine cooker with 2 burners and an oven. Isotherm top loading refrigerator with freezing compartment. Lots of counter-space and many cabinets. The fresh water tank holds 140L (37 gallons). A watermaker driven by the port-side diesel engine makes 60L (16 gallons) fresh water in an hour giving the option to save on carry-on weight of water in the tank. Three Par/Jabsco toilets with hand pumps. 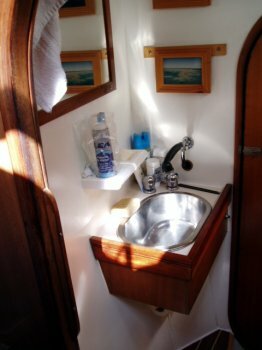 Sanitary sinks with cabinets and mirrors. Four showers. Pump driven shower drains. Day light and ventilation hatches in all four door enclosed sanitary rooms. A fifth fresh water shower on the swimming platform on the port-side transom. An AirBreeze windgenerator and an angle adjustable rack with 6 x 85-Watt Solavolt solar panels are part of the bimini construction. BEP 26-switch circuit panel for monitoring fuel and fresh water levels in tanks. 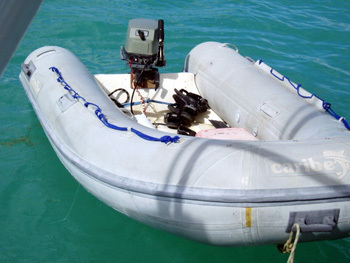 Caribe C10 (Hypalon) dinghy with 4-cycle Yamaha 6hp outboard engine. Lofrans Tigre electric anchor windlass with remote control. Delta anchor 25kg on 75m galvanised chain. Three color LED navigation light and LED anchor light in the mast top. Secondary deck level halogen navigation lights port, starboard and stern. 55W Deck light and steam light half way at the mast. Both steering stations have a Plastimo magnetic compass. Steiner binoculars waterproof with compass. Scuba diving equipment (PADI certification). Many tools and spare parts. 8x 20L diesel fuel jerry cans. 4x 20L fresh water jerry cans. EPIRB distress beacon registered July 2014. Plastimo 4-person automatic inflating liferaft (2014). 4x Automatic electric bilge pumps. Man-overboard strobe with horse shoe buoy and strobe-light.